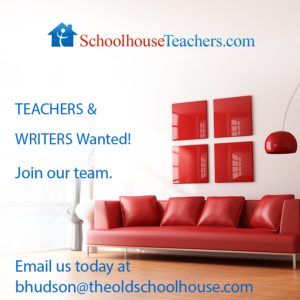 SchoolhouseTeachers.com, the curriculum site of The Old Schoolhouse® Magazine is growing, and we’d like you to be a part of it! We need business owners, bloggers, moms, teachers, and authors to join us in providing quality homeschool material to families all around the world. Deadlines and length of material are flexible. If you want to write but aren’t sure where to start, we’re happy to give you a list of topics to choose from. We are actively seeking to work with teachers for all subjects, but a few specific needs we are trying to fill include Latin and other foreign languages, SAT/ACT prep, and elementary math. Contact Executive Editor Bonnie Rose Hudson at bhudson (at) theoldschoolhouse (dot) com today. Let’s see how we can work together!